Yesterday, my friends, was one of those days you remember fondly forever, and these macaroons were part of it. Ironically the morning started with me going to the dentist. I had cavities to be filled. But after that is when the good stuff got going. The short, PG version: my best friend and I had a beach day, went on a long walk, saw all the sights, talked about all the things, ate all the veggie foods and finished the night with a heart-breaking/heart-mending doc about pandrogyny, love, and industrial music while munching these macaroons [that I improvised and whipped up in an exhausted stupor in about 15 minutes at 10:30pm]. About the recipe: delicious, decadent, pretty healthy, and they come together in SERIOUSLY under 20 minutes. Keep 'em in the freezer for a chocolate-y snack whenever you want one (i.e. everyday). You can fancy up the recipe or make it more basic as you see fit. 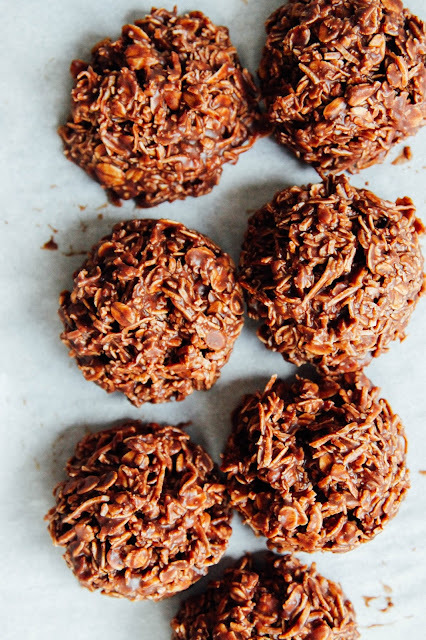 When I made them last night I only used coconut shreds, no vanilla and no salt. But today I added oats... and vanilla... and salt. They help round out the flavours and add nutrition. I made them with peanut butter last night and needless to say that worked juuuust fine, but today I used walnut butter and that was also delicious. As usual: do what works for you. Whisk together the maple syrup, nut butter and coconut oil until evenly combined. Whisk in the cacao powder, vanilla powder and salt until you have a smooth, liquid chocolate mixture. Stir in the coconut and oats until they're fully coated in the chocolate. Scoop into balls (I used an ice cream scoop) and throw in the freezer for 10-15 minutes. Enjoy! Oh yay! These look so good. I've been craving chocolate lately. My husband would love these.. 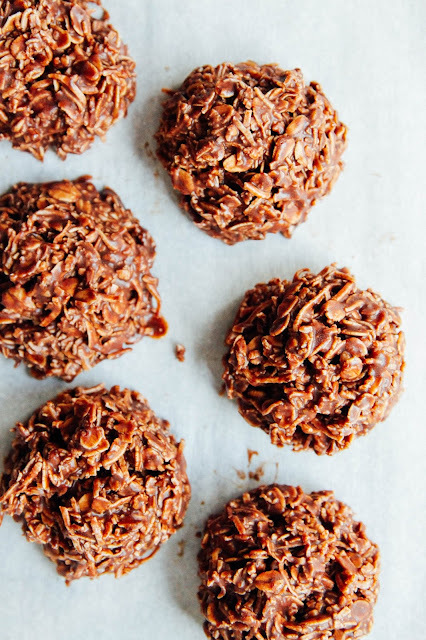 They are like no bake cookies but healthier! Awesome Em! Have been waiting for a macaroon recipe. Just made them, haven't been in the freezer yet but love them! 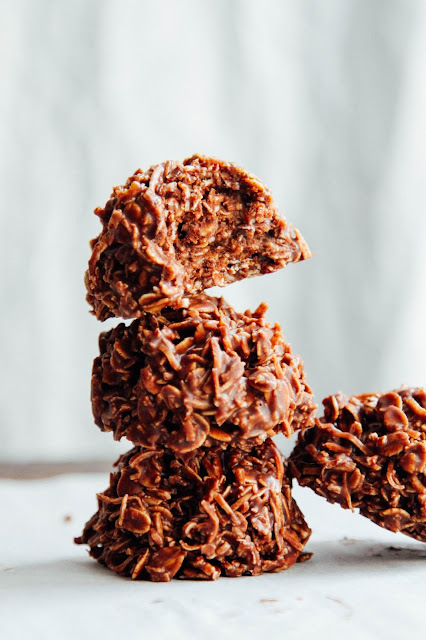 I made these a couple of nights ago and they were absolutely delicious! All of our favorite ingredients in one amazing treat. Definitely going to be a regular for us.